In less time than it takes for the oven to heat up, kids can have delicious fish cakes ready to go, and with more goodness in them than any you can buy in the shops. There are added veggies for more taste and a vitamin boost, not to mention that fish boosts your brainpower! 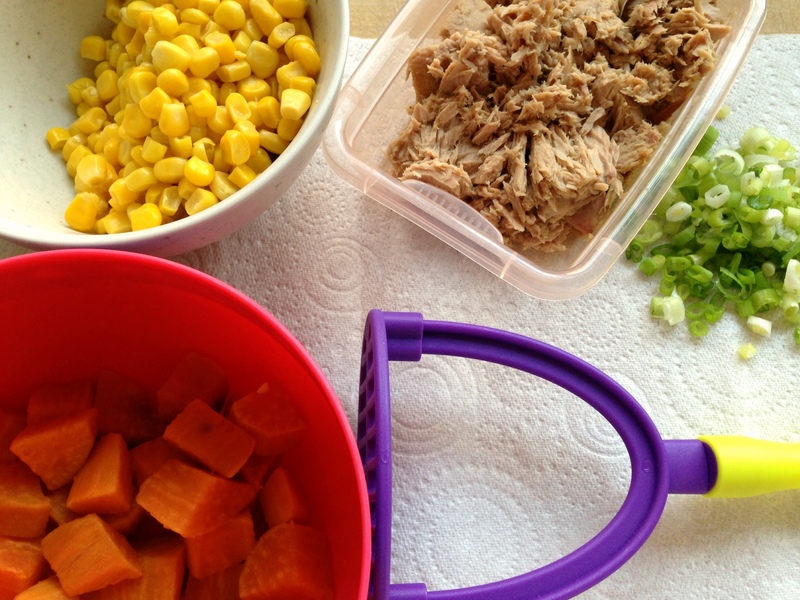 Make sure that your grown-up opens the tins of fish and sweetcorn for you–they can be tricky and they have sharp edges. 1. Get a grown-up to peel and cut up the sweet potato into chunks, and then boil or grill until soft. 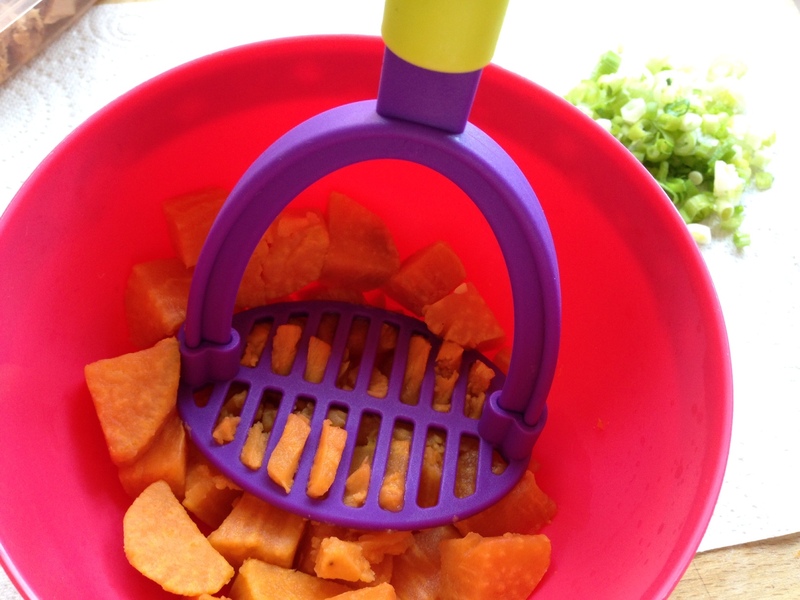 Mash-up the sweet potato. 2. Drain the tinned fish and then flake it into a bowl using a fork, breaking up the pieces. Add the sweet potato and mix together. 3. Now add the sweetcorn and brown sauce. Snip the spring onions into small pieces into the bowl. Mix this all together along with a spoonful of the beaten egg. Preheat your oven to 180c, 350f, gas 4. 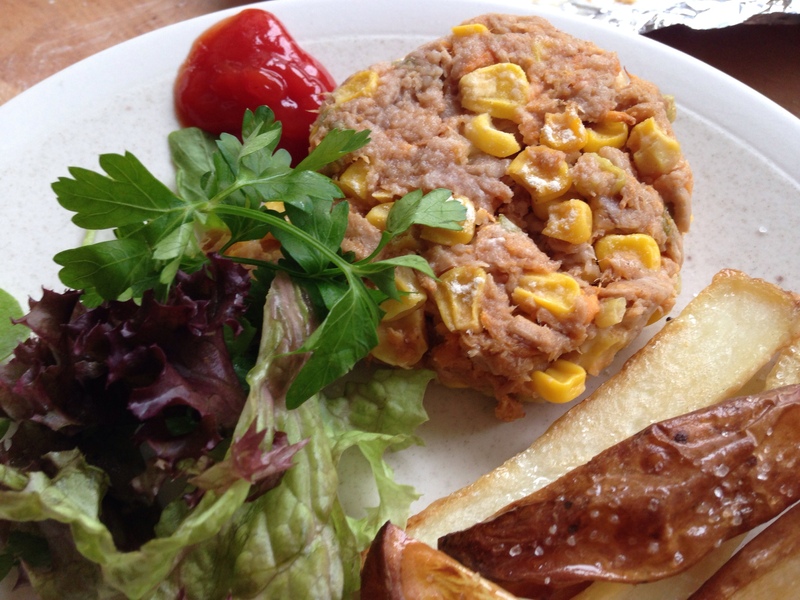 Why do we put egg into fish cakes and burgers? Egg works like a glue for food, and helps everything to stick together. 4. 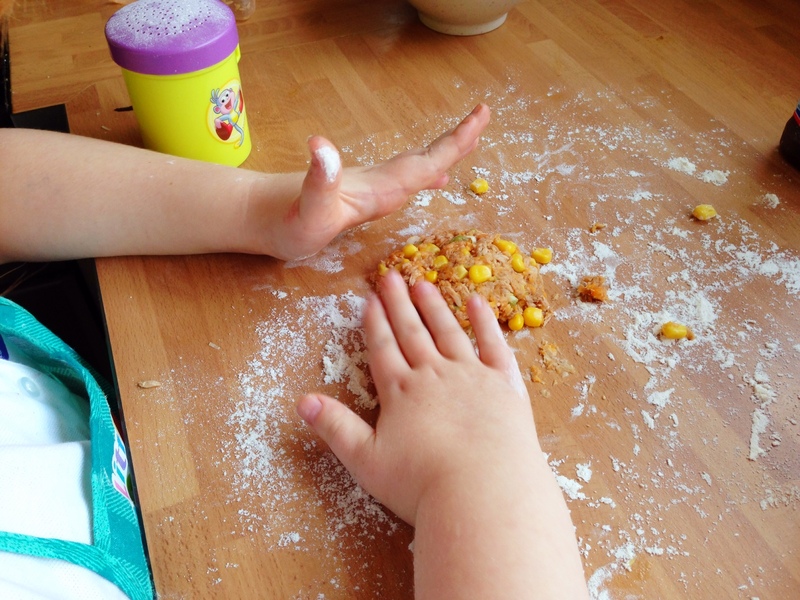 Sprinkle flour onto your worksurface and divide up your mixture into 6 balls. Flatten the balls until they look like fish cakes and put them onto a baking tray. 5. You can paint the fish cakes with the rest of the egg and add some breadcrumbs to coat the outside if you wish. Bake them in the oven for 20 minutes while you get on with something fun. These taste super-yummy with one of our alternatives to french fries–we like them with our homemade oven chips. Eating Fish Boosts Your Brainpower! Did you know that salmon and other oily fish are rich in something called Omega-3? Omega-3 is great for improving your brain function and can help you to concentrate better in school. You can change the recipe in little ways to make it more your own. Try using herbs instead of spring onions (chives are good), tomato ketchup or 1 tsp of mustard instead of brown sauce, or use some fresh cooked fish instead of tinned (smoked haddock is the yummiest).